The Japanese Chin is also known as the Japanese Spaniel. In Japan, dogs are usually viewed as working or helper animals. The Japanese Chin is unique in that they are owned strictly for companionship. Their distinct appearance and personality eventually captured the hearts of Japanese royalty and resulted in ownership being restricted to those of royal and noble blood. Each noble house bred to their own standards. Because of this, there are many variations of the Japanese Chin including size, coat density, eye set, personality, and body type. Our focus is on producing Japanese Chins that are healthy, happy and correct to the standard. The Chin is very loyal to their family and does have a cat-like personality. They are playful and loving. He is the epitome of a companion animal as this is the primary purpose for which he has been bred. He is not a fragile dog by any means, but due to his small size, families considering the purchase of a Chin must understand that all interaction between this dog and small children must be closely supervised as accidental injury to the dog could occur. Maintaining a Chin's coat is as simple as a thorough brushing once a week. 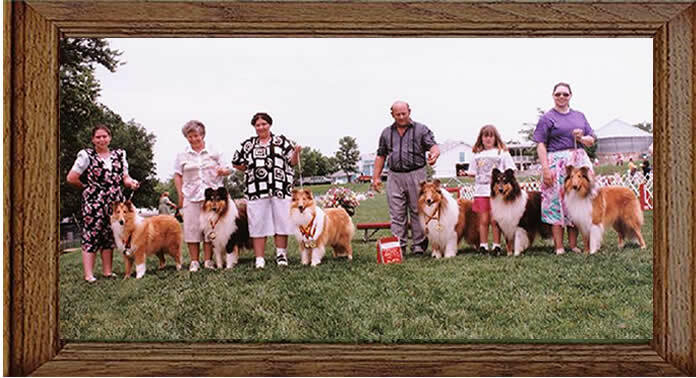 They are a relatively clean breed who does not require excessive bathing or clipping. The Chin comes in Black and White, Tri (Black, White and Tan), Red and White and Lemon and White. This charming little lap dog has a huge heart for everyone and is bound to steal yours from the moment you take him home!